Is it better to do a SSK or a Slip 1,K1,PSSO? I tried both and found out it makes no difference. There may be a difference, but I can’t see it. I have been noticing that my SSKs that are next to YOs are zig-zaggy where as my K2togs are smooth. I think it is my tension. I need to make sure that I don’t pull the left slanting decreases too tight. Also I think it is just the nature of the decreases, a K2tog just lays more naturally with the yarn leaving the stitch flowing into the next stitch. Oh well, I played around with both stitches this morning and knit this swatch. The socks I am attempting to knit now have both types of decreases. I just wanted them to match. If anyone has a preference or a way to make SSKs smooth please let me know. This entry was posted on Monday, June 15th, 2009 at 3:00 am and is filed under Knitting. Tagged: Knitting. You can feed this entry. You can leave a response, or trackback from your own site. Thanks Kathleen. I think I’ll try #7, that looks really smooth. Ihave NO idea what you just said, but it is really pretty so far! when next to a yo instead of doing a ssk I stick my right needle through the back loops from right to left of the two stitches snag the yarn and pull it through. you get a nice neat left slanting decrease. i hope you understood that. Thanks Ria, I’ll try that too. 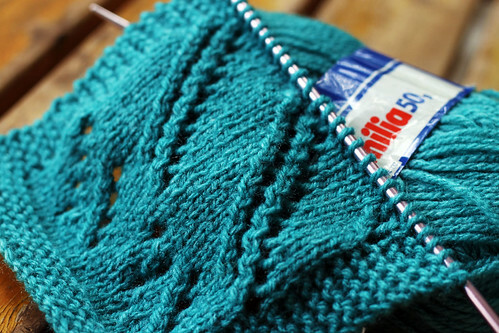 I find that a slip as if to knit, knit 1, psso gives a texture that a ssk does not. If I am looking for something to pop a bit, such as the basket weave in the Hanami, then that is the way to go. I agree. It’s almost same. The piece is coming out really well. I love the shade of blue. Thanks Ruthee and Bhavna! I will try those too. I never realized how many ways there are to do the same thing. The yarn follows the same path, unless the stitches cross, but the result is slightly different depending on how the stitch is worked. Mind boggling.